It all began in Summer of 2015 as a design concept for a luxury watch that would embody both the classic aesthetic and a modern high-end urban feel. 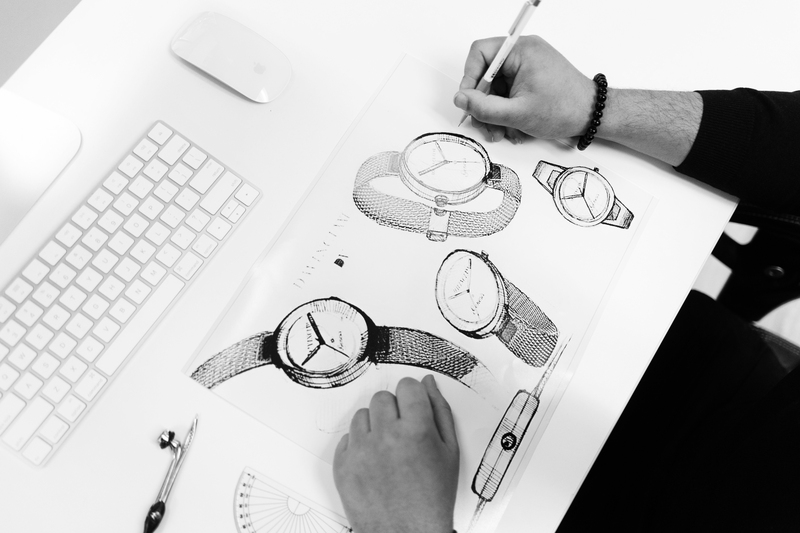 What started almost as a mix of self-taught passion for design and enthusiasm for fashion and watches quickly evolved into a full on brand project. It was something that I could not foresee at the moment, nor exactly planned to happen, but rather a constantly growing vision and a feel that seeked expression. And it just happened to all come together at the right time. What started with dozens of sleepless nights, hand made sketches and Photoshop renders and mere ambition was slowly starting to become more real. It's always an interesting feeling, seeing something you once envisioned finally take its form. Through the entire creative process, there had been many eye opening realizations, one of which creativity being, perhaps one of the most unpredictable qualities, as it comes upon one often unexpectedly and has its requirements, such as a certain expressive state of mind, true inspiration and a myriad of time. Fast forward, it was only about after year, of carefully studying relevant design trends and collaborating with a few prominent local (YEG) creatives, that we have finally managed develop the first full sketches and 3D models. And that was the first moment when I truly felt we had something special. Now it was the time the make sure the design was as perfect as it could possibly be and with dozens of hours of design reviews and gathering feedback from designers, fashion "know-it-alls" to "fashionista" friends, we have decided to take the vision a step further and try to make it a reality. It was an ambitious project, considering none of us had a formal experience in manufacturing nor production, but the more we kept working on it, the more it seemed attainable. It was very important to us to seek a highly established factory, one that not only could understand the essence of what we are trying to create, but also was be able to execute it at a world-class level. "One cannot rush perfection" - as G.Versaceonce famously said. Our goal since the start has always been creating pieces only of an outmost quality, that would allow for one's self-expression and uniqueness. And after a few trial and errors, we unexpectedly got an email from one of the most prominent international manufacturers, who has worked with such brands as Movado and Vitaly, that they would love to make "the dream a reality". It was almost unbelievable, that it all seemed to have happened that way and all the stars just seemed to have been suddenly aligned. And that was perhaps one of the other realizations I have learnt as a creative: "when you truly believe in something, its almost as if the universe can sense that energy and wants to help you in whatever way it can." Using advanced 3D modelling, we've been able to bring our vision to reality and ensure high precision and accuracy of all the details. And that was it, we had the vision, the team and a reliable manufacturer to execute it, but that was where the true challenge came upon.. After a few iterations of prototyping it appeared that it was nearly impossible incorporating our "signature engraving plate" as we once planned from an engineering stand point. And that was the moment of truth.."The signature engraving plate" has been our main idea for customization and making the pieces unique, all the way since its inception and it was something we just could not negotiate on. It was something I've always felt, we stood for as a brand and had to embody. So we had an option to either fully get rid of it or find a solution no matter what. And we decided to choose the latter. After a few more months of going back and forth with our manufacturer, we've finally hit a breakthrough. We made a custom mold from scratch specifically for the case, (usually only allowed for the most high end luxury brands) and the engraving plate separately, allowing it to seamlessly attach to the band. And that alongside with the premium mesh band, high grade 18k Gold and our signature black Swarovski crystal resulted in an outstanding luxury feel. Final edition x Rose Gold. It was a truly incredible moment, to be able to see an ever growing feel and an idea fully evolve into something tangible over the past two and half years and it has undoubtedly been a journey, but one that's worth it. And we want to inspire you to always follow yours, no matter how different it might be. Because what matters is, just like you, it's unique.